Get Involved - Volunteer Opportunities, Fundraisers and more. "Adult Volunteer Program for people ages 16 and up. Our Junior Volunteer Program is for people 12-15 years of age and requires an adult supervisor (18 or older, parent or guardian) working side-by-side. "Martin Health System teenage volunteer program is designed to give students the opportunity to volunteer in a hospital environment. In order to assure that Martin Health maintains its high quality of service to the community, our teenage volunteers are selected on a competitive basis." - More than $3.6 million in labor cost savings to Martin Health System in calendar year 2014. Click here ! To volunteer with RSVP, call Marsha Jordan (Coordinator for St Lucie) at 772-323-5286 or email Marsha_Jordan@experienceworks.org . From opportunities at Martin County Public Libraries, Growth Management, and Parks and Recreation. For more information, and other opportunities, visit www.martin.fl.us . The Hobe Sound Nature Center is a private, non-profit organization located at the Hobe Sound Nature Wildlife Refuge. "The Manatee Observation and Education Center is an active environmental education center in Downtown Fort Pierce. We have our Exhibit Hall and our Vanishing Mermaid Gift Shop which both have ongoing needs for volunteers in many different capacities. The shifts are 3 ½ or 4 hours each. All prospective volunteers need to complete an application. Teens can be as young as 14 and all adults must complete a background check. Our Exhibit Hall has opportunities for Greeters, Discovery Guides (explaining the exhibits to our guests), Roving Naturalist (outside position teaching about the Indian River Lagoon and spotting Manatees), Education Assistants (work with our education coordinator for special educational programs), Vanishing Mermaid Gift Shop Sales Assistant or Stock Assistant, Clerical Assistant (works in back office in a variety of positions). Please contact Trish Parker, Volunteer coordinator at 772-466-1600 x3334 or email at Volunteer@ManateeEducationCenter.org . You can also fill out an application on Manateecenter.com . at participating Walmart locations. All lifesaving donors will receive a FREE Walmart $10 Gift Card, and a FREE Wellness Checkup including blood pressure, pulse, temperature, iron count and cholesterol screening. 38% of the population can donate blood—of that, less than 10% actually do. Blood cannot be manufactured. It can only come from generous blood donors. If every donor gave just one more time each year, there would be no more blood shortages. ID required. Donors must be at least 16 years old. Those who are 16 years old need parental permission. One offer per donor, per donation. No cash value. Not-transferable. While supplies last. Not responsible for lost or stolen gift card or coupon. If you have recently donated, thank you. Please visit us when you are eligible to donate again. Visit https://goo.gl/v2PUW2 for more information and locations. at Participating locations. All lifesaving donors will receive TWO FREE Movie Tickets (while supplies last), FREE Wellness Checkup including blood pressure, pulse, temperature, iron count and cholesterol screening. 38% of the population can donate blood—of that, less than 10% actually do. Blood cannot be manufactured. It can only come from generous blood donors. 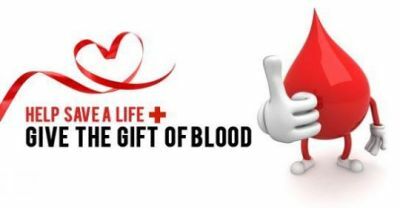 If every donor gave just one more time each year, there would be no more blood shortages. ID required. Donors must be at least 16 years old. Those who are 16 years old need parental permission. One offer per donor, per donation. No cash value. Not-transferable. While supplies last. Fandango voucher valid for one ticket purchase transaction only. Remaining balance may not be applied to additional ticket purchases. Maximum voucher value is $12.50, inclusive of convenience fees charged by participating theaters. Consumer is responsible for any cost beyond $12.50. Not responsible for lost or stolen gift card or voucher. If you have recently donated, thank you. Please visit us when you are eligible to donate again. Visit https://goo.gl/LCL4yL for more information and locations. 9AM – 12PM and 1PM - 4PM. Family Volunteer Day is a day that celebrates the power of individuals and families who work together to support their neighbors in need here on the Treasure Coast who may not know where their next meal is coming from. The first Saturday of each month, families use this day to teach children valuable, real life lessons about compassion and caring as we work together to sort food and non-food items, bag pet food, pack backpacks, and pack senior and veterans boxes for those struggling with the issue of hunger. 7:30AM - 1PM. "Keep Port St Lucie Beautiful Volunteers will register for the event, enjoy a free breakfast, and then be transported by bus to several locations throughout the City that are most in need of cleanup. After the cleanup, buses will bring volunteers back for free lunch, raffles and lots of fun for the whole family. Open to the public. Volunteers Needed! The annual revitalization day for Lincoln Park. Please save the date and plan to join us!